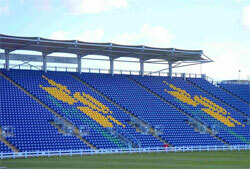 The new SWALEC Stadium is home to Glamorgan County Cricket Club. Following a massive redevelopment of the ground, it was officially reopened on 9th May 2008, with an increased capacity of 16,000. The stadium recently gained massive global recognition when it played host to the 1st Ashes Test Match of the 2009 series. It was the first Ashes match be played outside of an English or Australian venue. The match ended in an exciting draw, with England just managing to bat out the overs on the final day of play. The £9.5m SWALEC Stadium was built in less than 18 months. It is situated on the banks of the River Taff in Sophia Gardens and is adjacent to the Welsh Institute of Sport. The SWALEC Stadium is easily accessed from Cardiff city centre via a footpath that runs through Sophia Gardens. The SWALEC Stadium is available for conference and banqueting events, catering for up to 2,000 delegates or guests. For further information call 029 2041 9314 / 029 2041 9315. By Car Travelling from the East: Exit the M4 at Junction 29 and follow the A48M towards Llandaff. Join the A4119 and bear left onto Cathedral Road. The SWALEC Stadium is situated in Sophia Gardens, which can be accessed via Sophia Close off Cathedral Road. By Car Travelling from the West: Exit the M4 at Junction 33. Follow the A4232 for approximately 6 miles and exit via the slip road onto Leckwith Road. Continue along Leckwith Road until you reach the junction with the A4161 where you need to turn right. Follow the A4161 towards the city centre and turn left onto Cathedral Road (A4119). The SWALEC Stadium is situated in Sophia Gardens, which can be accessed via Sophia Close off Cathedral Road. By Bus: Bus Routes 24, 25 and 62 run frequently from Cardiff Central Bus Station to Cathedral Road. For further information visit the Cardiff Bus website. By Train:Cardiff Central Train Station is located approximately 1 mile from the Stadium. For train timetables visit the Arriva Trains website and also the Great Western Railway (GWR) website.